Five hundred seconds is exactly eight minutes and twenty seconds. Nope, that’s not rocket science. But that was what I had to keep in mind as I watched the stopwatch application on my smart phone during the last J-2X test. Eight minutes and twenty seconds. That seems like a really long time when you’re counting every second. At the NASA Stennis Space center you have collected the directors from seven of the ten NASA field centers around the country. You have representatives from the NASA headquarters in Washington, DC. You have a live feed being picked up by NASA TV and broadcast into the living rooms of thousands or millions of dedicated NASA TV junkies. You have dignitaries in suits and technicians and test conductors in jeans and Hawaiian shirts (test-day tradition), reporters with notepads and cameras from every paper and television station in the greater New Orleans and southern Mississippi area, and, sitting in his ceremonial throne, the Grand High Exalted Mystic Ruler of the International Order of Friendly Sons of the Raccoons. Well, okay, that last part about the Exalted Mystic Ruler is just fictional (bonus points to anyone who gets the 20th-century cultural allusion without Google help), but that’s the way that it felt. This was test A2J008, the seventh planned hot-fire test of the very first development engine and it was time to play show-and-tell. Does everyone remember show-and-tell in elementary school? You bring in something that you think is neato or special and, by getting up in front of class and talking about it you reveal something about yourself and you accidentally practice public speaking and presentation. 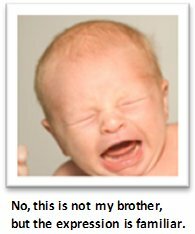 Once, when I was seven years old, I brought in my new baby brother, or, well, my mother did so at my behest. I wish that I could remember what I said about him. I imagine it was something like, “He’s short, cranky, and smells funny.” Today, at least he can say, he’s taller than me. Can’t see anything? Okay, I’ll expand the picture in pieces starting on the left. 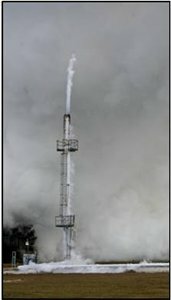 This is the hydrogen burn stack. 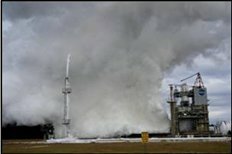 All of the excess hydrogen coming from the facility or from the engine before, during, and after the test needs to be burned off. This is all bleed flows and waste flows that you cannot avoid when dealing with a cryogenic propellant. If you let hydrogen accumulate anywhere around the facility, then “BOOM” you’re eventually going to have an explosion. 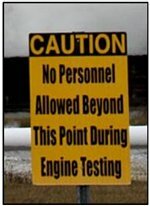 Talk to the guys who work out in the test areas and they’ll tell you plenty of tales of such things. What is amazing as you’re standing out in that field to watch the test is the radiation heat coming off that thing. It was a chilly day and yet you almost feel like you’re going to end up with a sun-tanned face. It feels like the sun while you’re on the beach except that as warm is it makes your front side, your back side is still chilly from the blustery November breeze. Kind of an odd sensation being both overheated and chilly at the same time. 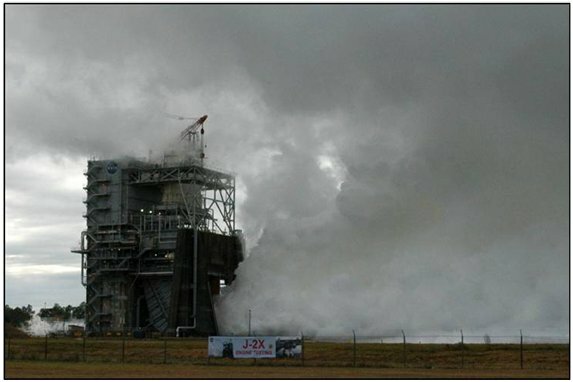 And, on the right-hand side of the picture, in the distance, is test stand A-2 with the engine firing. In the middle of the picture below, there is a tiny, very white spot in the middle of the test stand. That’s the flame coming directly out of the engine nozzle. In the bottom right corner of the picture below you can just see the edge of one of the liquid hydrogen barges. 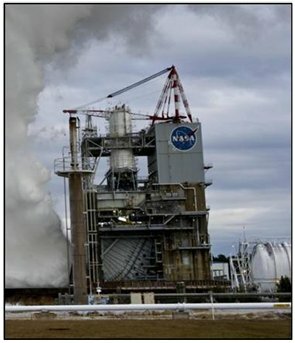 For both liquid oxygen and liquid hydrogen, for extended duration tests, the propellant tanks on the test stand are not quite big enough to hold all of the necessary propellant. So, during the test you actually transfer propellants from these barges into the test stand tanks. So, the engine is draining the test stand tanks while you are simultaneously re-filling them from the barges. With all of this going on, you start to appreciate the coordination necessary to pull off one of these tests. Here, below, is a picture of the test from the other side of the stand. Why is this important (other than the sign on the fence clearly advertising what you’re looking at)? Because this is the side from which all of the non-NASA folks, some of the NASA dignitaries as well – including an astronaut representative – and the local press corps watched the test. So as to not keep you in any more suspense, the test came off perfectly. 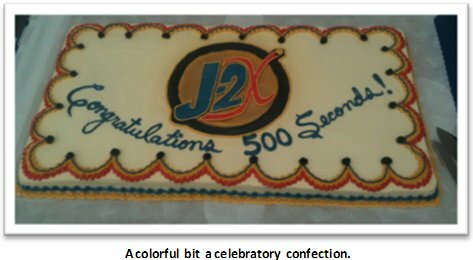 The full, planned duration of 500 seconds was achieved thereby effectively tripling out test experience to date. The coverage on NASA TV was good. The bigwigs clapped and cheered with infectious excitement right along the rest of us. And the press corps wore out their thesauruses trying to capture just a slice of the actual experience. It was a complete success on all fronts. Congratulations to the Pratt & Whitney Rocketdyne J-2X development team, the NASA SSC test crew, and the NASA Marshall Space Flight Center project management team. While I had every bit of confidence that we’d be successful, with so many people watching our show-and-tell exercise, those 500 seconds — eight minutes and twenty seconds — ticking away on my stopwatch seemed like a whole lot longer. Whew! and Yahoo! 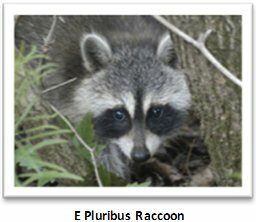 i started reading this blog about half-way through the process. i enjoyed catching up. and i am keeping a keen eye on all these developments. it is truly refreshing to hear from one who had so much input to the design of this engine. as opposed to a suit or talking head that we see everyday(almost) on NASA TV. i hope that this blog will continue, and i want my bonus points as well. congratulations on a great test. heres hope for even greater things in the future. At the risk of sounding sentimental or maudlin, I have to say that at a time when there’s so much bad stuff going on in the world, it’s good to know this is happening as well. Also, as a foreigner, I think I’m good to say that doing this is part of what makes the US a special country. I don’t think it’s too much to say that the manned space program, even with the difficulties and tough times it sometimes goes through, has always been, and continues to be, a showcase for everything that’s best about the US, and it’s not coincidence that the US is still, after fifty years of manned spaceflight, still the only country prepared even to contemplate sending people out beyond Earth orbit. Next Next post: Welcome to the J-2X Doghouse: You Dropped a Bomb on Me, Baby!